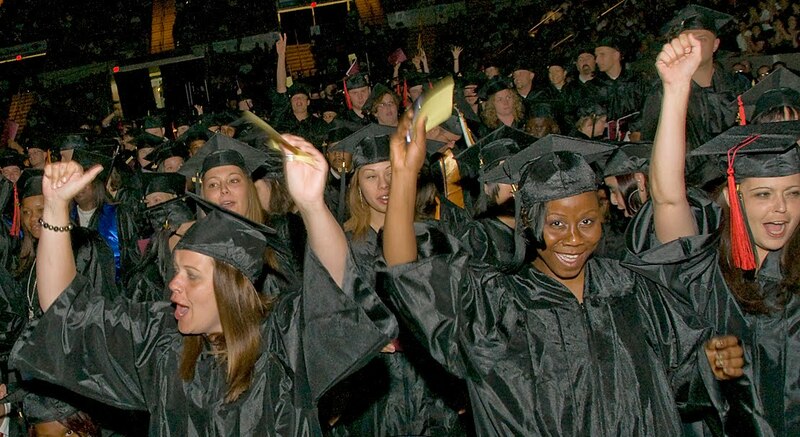 2010 Springfield Technical Community College graduates celebrate at June 2 commencement exercises. The authors of the study - Anthony P. Carnevale and Nicole Smith – argue that in the next ten years, high school graduates and high school dropouts “will find themselves largely left behind in the coming decade” for decent paying jobs. They conclude that post-secondary education will become essential for entry into the middle class. Meanwhile, the cost of college is escalating – a vicious circle for those of modest means who must obtain a college education to enter the middle class but often do so with substantial college debt. During the “Great Recession” as it has become known students are flocking into colleges, especially public colleges, using this time of high un-employment to earn a degree or retrain with additional post-secondary skills. Our society should support them with higher levels of financial aid and additional funds for public colleges. To do otherwise will increase the pain of the “Great Recession” for our youth who will either be locked out of college or leave with college loans that will take decades to pay off. Professor John LaFrancis demonstrates the operation of a computer controlled milling machine at the Smith and Wesson Center at STCC. Students are left to right David Santos, Daniel J. Miller, Shurwell C. Roach and Ryan T. Maheu. US manufacturing is growing – one of the few stars of the US economy over the past six months. Releasing their August survey of hundreds of US companies, the Institute for Supply Management reported an increase over July of their manufacturing index from 55.5 in July to 56.3 in August. Numbers above 50 indicates growth in the sector which accelerated according to the survey in August. US manufacturing has changed dramatically over the past two decades with an infusion of capital equipment increasing productivity and product sophistication. This has caused a change in the needed education level of factory workers. More technically trained employees – usually at the community college level – are needed to run factory robots and computer controlled machinery. The modern competitive American factory is not your father’s facility. It is clean, well lit, highly efficient and filled with expensive, often made to order, machines. Employees are valued for their knowledge and skill with opportunity for educational advancement. Community colleges around the country have responded to the demand for skilled factory employees by establishing new programs and revising existing ones. At Springfield Technical Community College the Mechanical Engineering Technology trains students for jobs running Computer Numerically controlled machines (CNC) machines in the areas precision manufacturing industry. Enrollment is full and graduates are snapped up by local companies. While the program is rigorous requiring good mathematics skills and geometric ability, graduates look forward to well paying jobs and stable careers.